Recently, my thoughts have turned to panoramas. They seem to have fallen out of fashion in recent years, despite the tools to create them easily appearing in iOS, Windows Phone and Android. I suspect part of the reason for this is that smaller screens rule the roost just now. Even if they are high resolution, there’s still no way to really lose yourself in a large panoramic image unless it’s physically taking up a lot of space in front of your eyes. For the purposes of this post, I’ll define a panorama as a wide image where two or more images are stitched together. Here I’ll discuss some of the finer points of shooting, processing and displaying your panoramic pictures. Capturing panoramas has never really been difficult – the hard part is stitching together, but there are quite a few things to take into consideration. I’ve been reading quite a bit about how Colin Prior gets his best shots lately and in a lot of cases he uses a special panoramic film camera, a Fuji GX617, which is an impressive beast. It can create photos at a 3:1 aspect ratio (so no need to stitch the pictures), and it has a set of quite long lenses; 90mm, 105mm, 180mm and 300mm. Good luck getting your head around how a long lens and a wide picture appears. However, out here in consumer land, I am using a DSLR so I have a fixed aspect ratio sensor to work with. You need to have a think about the angle that you want to include in your panoramic. You can shoot a very wide angle with either three pictures or even ten depending on how much detail you want and what lens you have. For instance – the image at the top of this post is probably about 150° in real life. I used three shots at 20mm on an APS-C sensor, so at a very rough calculation (there will be overlaps) each frame is about 50° wide. However, on the image just above (click for a full size), I’ve used a 135mm lens to capture 7 shots, and that’s probably about the same angle, so the angle of each frame is about 21-22°. The image looks less tall, but the original panorama is highly detailed (go on, give it a click! ), in fact it’s probably about the 55 megapixel mark. So, you can gain detail by going with a longer lens, but you’ll get a less tall image than if you went with a wide angle lens. When you’ve got your gear out it’s bag, you’ll almost certainly need a tripod to keep things steady and in line. It’s really difficult to keep everything totally level, even with a spirit level on your camera, because the lens could be angled slightly up or down which could skew your shot. Shoot a few images at various points within your planned panorama until you get an exposure that you’re happy with and manually set your ISO, Aperture and Shutter speed – these cannot change when shooting your panorama, so no auto! You really need the light to be consistent right the way across your picture, so if your last shot is pointed at the sun and your first is 180° in the other direction, you could end up with a massive bright blur at the end of your panorama. When you’re happy with the exposure, look through your viewfinder and visually pick a point to the right (if you’re panning your camera right) or to the left of your image, and remember what it is. Now take your shot. Now pan your camera in the direction you want until your visual reference point is at the opposite side of the frame, then pick a new point, shoot, and then repeat the process. Once you’ve taken all your shots, take a quick flick through them on your camera screen and check that you are happy with the exposure on all the shots and that everything roughly lines up as you’d expect. If you’re not 100% happy – just go again. Your images are still in RAW format, so you have better control over the white balance – when you get it back from Photoshop, it’s a TIFF. Changing exposure on a large image requires a lot more processing than a small one, and we all know how hungry Lightroom and Photoshop are for all your processor’s threads. The great thing about Lightroom is that you can set the exposure, contrast, clarity and anything else you need in one photo then copy and paste it onto the other image in your series. If one is too bright or dull, then just adjust it and copy and paste the settings again. 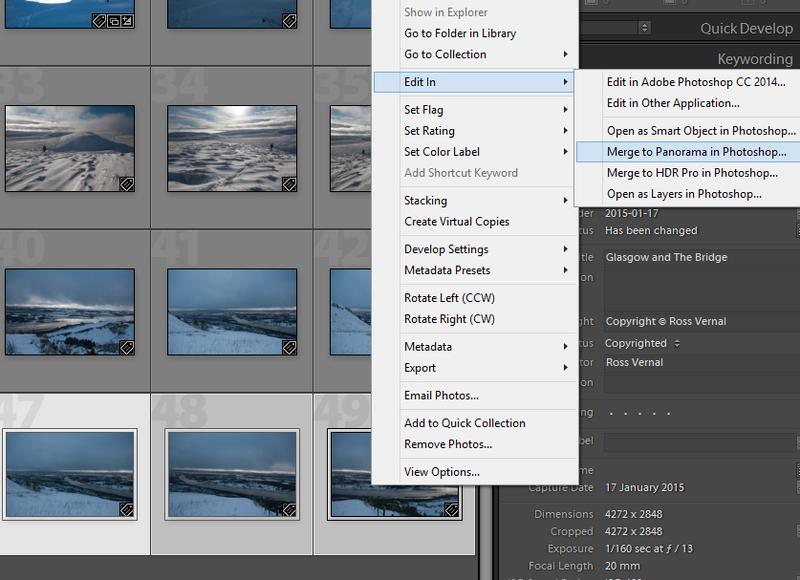 The next step is to highlight all the images you want to turn into a panorama and hit “Merge to panorama in Photoshop”. Yep – it really is that simple! Once you’re in Photoshop, I tend to just use the default settings and let it go and do it’s work. You’ll have to crop out the grey bits, but you can always use the content-aware fill if you’re needing to save some sky. 28 Jan	This entry was published on January 28, 2015 at 10:51 pm. It’s filed under Inspiration, Panorama and tagged art, aspect ratio, lightroom, panorama, panoramic, photography, photoshop, wide angle. Bookmark the permalink. Follow any comments here with the RSS feed for this post.